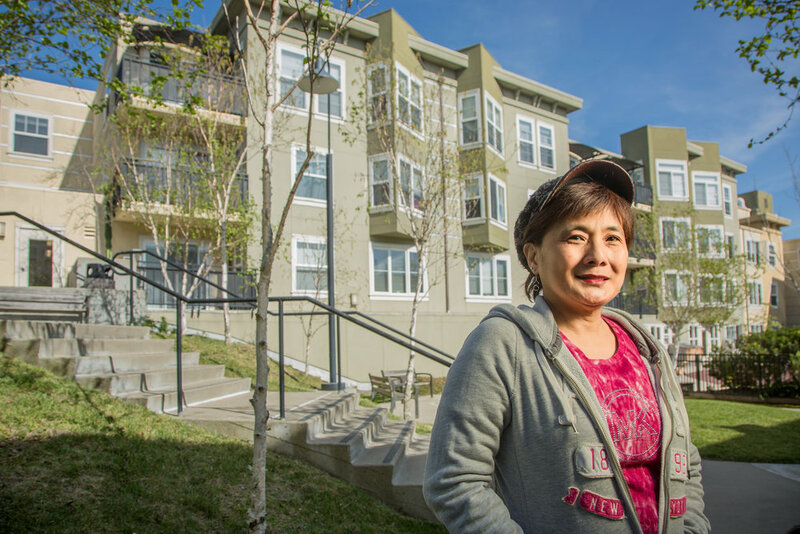 Housing plays a critical role in providing stability to low-income families and seniors. 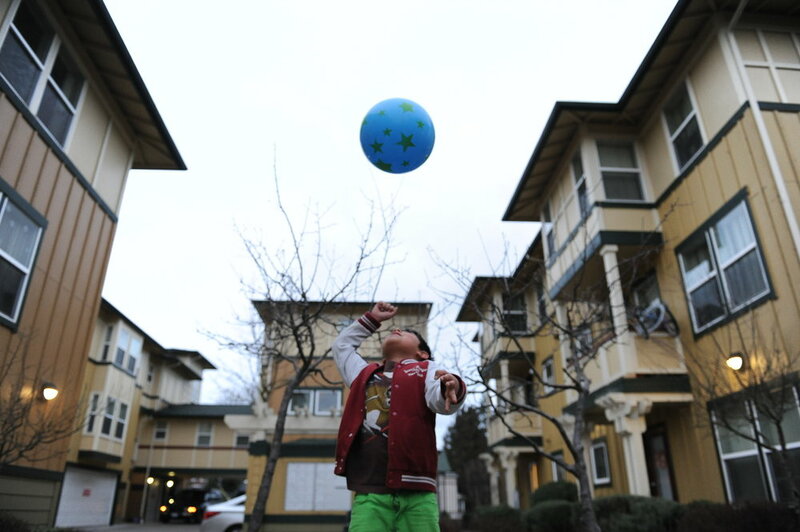 Housing stability enables children to perform better in school, adults to retain jobs, and neighbors to feel connected and safe. SAHF members strive to provide safe, well-maintained and welcoming homes where families will choose to live. 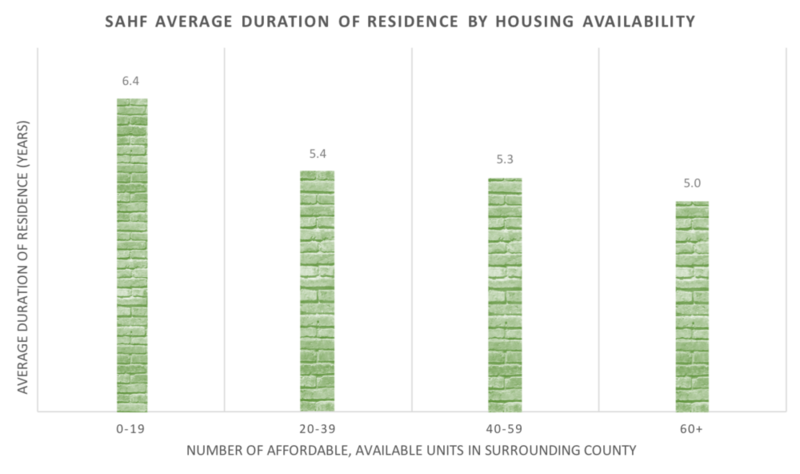 However, the goals of each housing community depend on the age and needs of the residents. For seniors, SAHF members work to provide housing that allows them to age in place and remain independent for as long as possible. For low-income families, SAHF members also work to promote upward mobility for their residents, providing them with the tools and opportunities to become financially secure and even purchase their own homes, if desired. 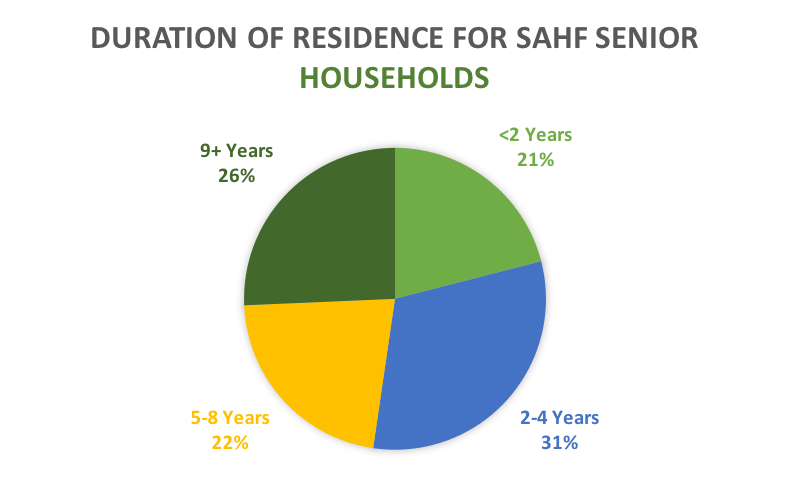 How long do families and seniors typically stay at SAHF member properties? The pie charts below break down the duration of residence for families and senior households (defined as households in which all household members are 65+ years old). For example, 33% of families stay at SAHF properties for less than 2 years. --From Evicted: Poverty and Profit in the American City by Matthew Desmond. Does the amount of other affordable, available housing have an impact on how long residents stay in SAHF properties? In a report titled “Mapping America’s Rental Housing Crisis,” The Urban Institute published best estimates of the affordable rental housing gap and federal assistance for extremely low-income (ELI) renter households at the county level in the United States. The accompanying data set provides the number of “adequate, affordable, and available units per every 100 renter households with income at or below 30% of AMI (Extremely Low-Income renters)” by county across the U.S. This essentially details the gap between the number of extremely low-income renters and the amount of available housing they can afford in their area. 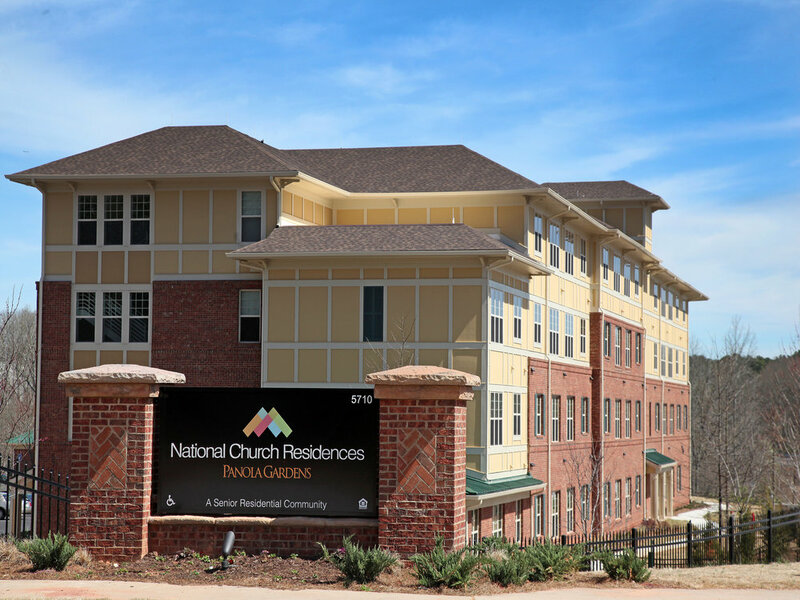 The data includes both market-rate and federally subsidized affordable housing. 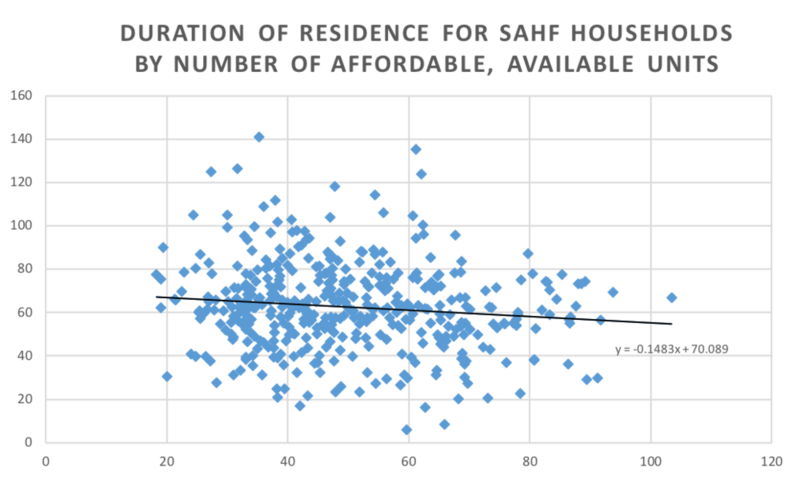 A linear regression analysis of the median duration of residence for each SAHF property against the number of affordable, available units in that property’s county shows a significant negative relationship between these variables (as shown by the scatterplot below). As the number of affordable, available units increases by 10 (x-axis), the median duration of residence (y-axis) decreases by 1.48 months or approximately 45 days (p < 0.001). In other words, when there’s more affordable housing available, families have more options and are more likely to move. This mobility may include moves to pursue other employment or educational opportunities. Each dot in the scatterplot represents 1 property. N = 906 properties (properties with duration of residence data that could be matched to county-level data in Urban Institute data set). 13 properties were located in counties for which Urban used state-wide estimates due to lack of accurate data. The bar chart shows the same data but broken into groups for easier analysis: average duration of residence is 6.4 years for counties with 0-20 units per 100 ELI renters, and 5.0 years for counties with more than 60 units per 100 ELI renters. N = 90,886 households in properties matched to the Urban Institute data set. SAHF data source is the 2016-17 (R3) Outcomes Initiative data set. How does this relationship compare to other households across the U.S. who receive federal housing subsidies or rental assistance? The most common type of rental assistance utilized by SAHF member properties is Project-Based Section 8. The chart below utilizes data from HUD's Picture of Subsidized Housing dataset to compare the duration of residence for all households in the U.S. living in properties with Project-Based Section 8 to the availability of affordable housing in their counties. This chart shows that as the number of affordable units increases by 10, the duration of residence for all Project-Based Section 8 households decreases by 0.84 months or 25 days. Since the SAHF portfolio showed a larger reduction in tenure when the number of available units increased (45 days), this data suggests that housing availability in the surrounding community may have more of an effect on SAHF households than other households living in federally-subsidized housing. 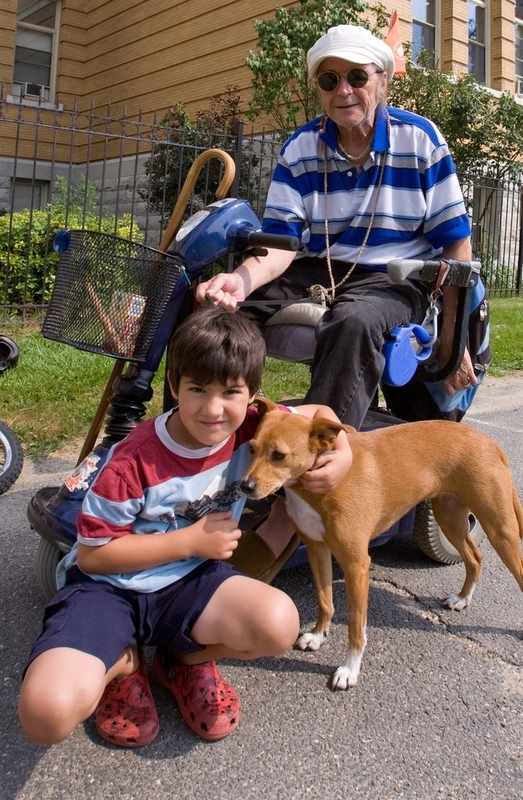 Therefore, SAHF members may be helping to promote mobility for their residents and ensuring that as many families as possible are able to take advantage of housing options that best meet their needs, whether that is a stable place to live independently and age in place or a home with access to employment and education opportunities that will support their economic mobility. However, as the SAHF members have diverse portfolios of properties that do and do not utilize project-based rental assistance, this data set is not a perfect comparison. More analysis is needed to investigate this relationship.